Q: Other than the ubiquitous poinsettia, are there any other houseplants that also bloom during the holiday season? A: Why of course! Mother Nature has given us a whole palette of winter-blooming plants to deck our halls. 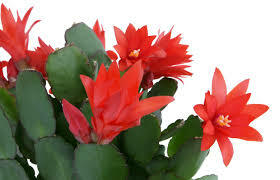 One of ArtisTree’s favorites is the Christmas cactus, native to the humid, coastal mountains of southeastern Brazil. It grows easily on rocks or trees in its native habitat, but with the right care, it can make a wonderful holiday houseplant that can bloom even at Easter. The trick is to manage the lighting levels. Christmas cacti can be damaged by exposure to more than small amounts of sunlight; however, very low light levels will prevent flowering. Display your plant where you can easily control the light it receives (continuous darkness for at least 12 hours is necessary to induce bud formation) and keep the soil moist but not wet. Don’t be surprised if your new plant loses its buds or flowers after you get it home. The drastic change in humidity levels from a greenhouse setting to your home could cause them to drop. Be patient. As your cactus acclimates to your home’s humidity levels, it will bloom beautifully.